Pan PC was my final project of the Postgraduate course in Electronics applied to the Arts (IUNA - 2008). A nonsense machine, generator of geometric images, built with the LCD screen of an old laptop, soda poppers, disposable cups, piezoelectric sensors, a refrigerator drawer and plenty of wires. Pan PC does not require external power (the physical pressure on the piezos generates it). Estero (swamp) is a reactive audiovisual electronic object. 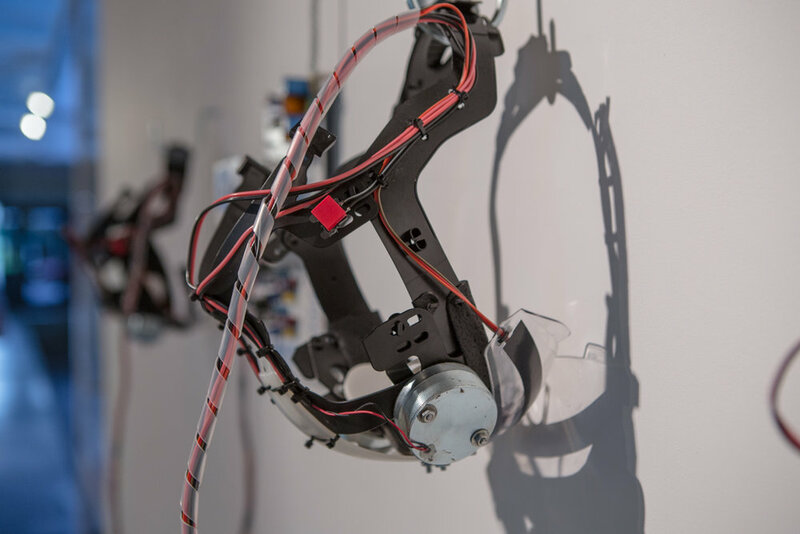 It performs a sound sequence in synchronicity with the generation of geometric lines on a broken LCD panel. The sound comes from the different actuators (DC motors, piezos, buzzers, relays ...) activated in sequence by the combination of two integrated circuits. The speed in the sequence can be modified by the public, blocking or giving way to the light that affects "flowers" constituted of photosensitive resistances (LDR). Estero uses a high percentage of recycled components and materials (motors, LCD display, refrigerator drawer) . 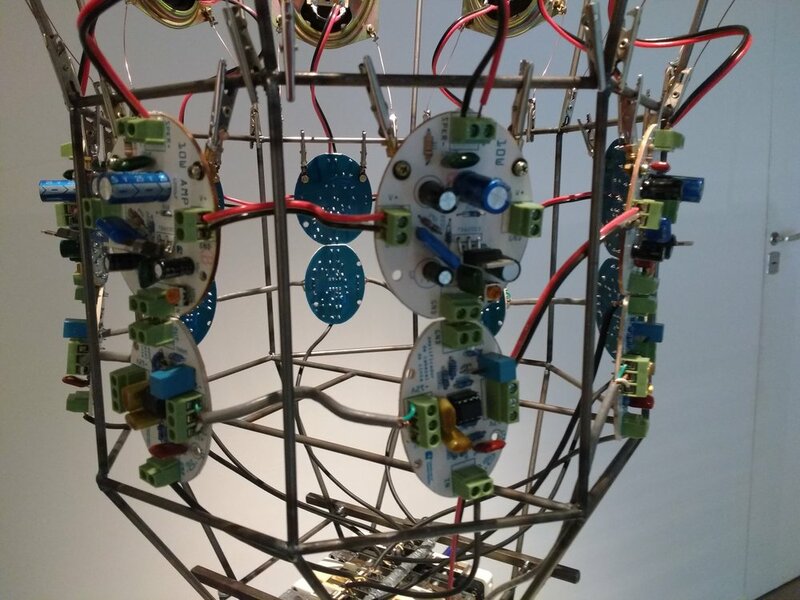 The result is a kind of artificial ecosystem with its electronic flora and fauna. 2x (Power of two) is a reactive audiovisual installation, built with reused hardware (scanner, PC speakers, LCD panel of an old laptop, etc.). 2x explores, in a basic way, the relationship between numbers, image and sound, using at its core a low cost integrated circuit, designed to perform simple mathematical operations (frequency division of a square wave signal). Simultaneously, a projected image will create changing geometric patterns according to the sound that is heard. 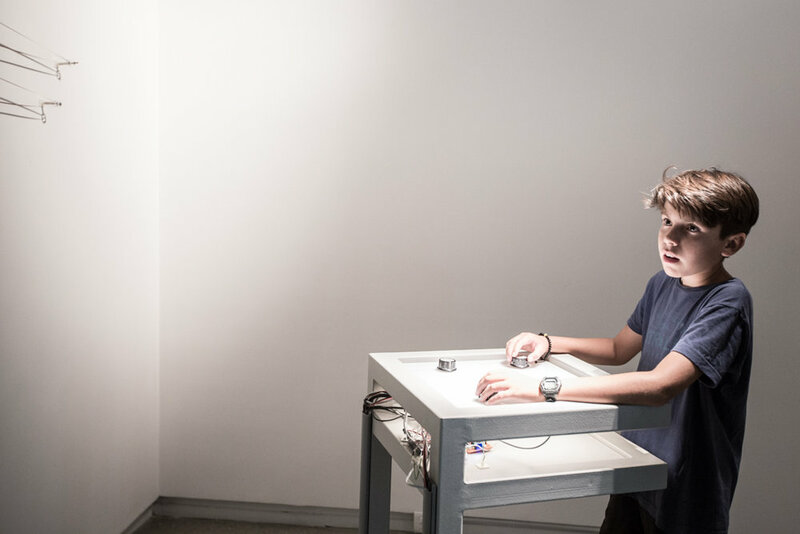 The name (Power of two) not only alludes to the audiovisual representation of these arithmetic operations but also to the quality of its physical interface since the "instrument" is executed by placing the two hands (only one does not activate it) on the control surface . The amount of surface of skin in contact with the interface will determine the speed of the rhythmic sequence. Cristales líquidos (Liquid Crystals) is an installation of variable dimensions composed of a variable number (from 6 to 20) of liquid crystal displays (LCD) controlled for the generation of geometric visual patterns by an analog electronic circuit. A variable number (10 to 40) of buzzers and loudspeakers simultaneously transform into sound the logical operations carried out by the integrated circuits, designed to "excite" the displays. Cristales Líquidos in its version for the Video and Medial Arts Biennial 2012, worked exclusively with solar energy, without the use of batteries for storage. The installation worked correctly in full light (from 10 a.m. to 7 p.m.) and then began to operate erratically until it finally went out. At dawn, it began again to function in an unstable manner until the amount of sunlight stabilized. 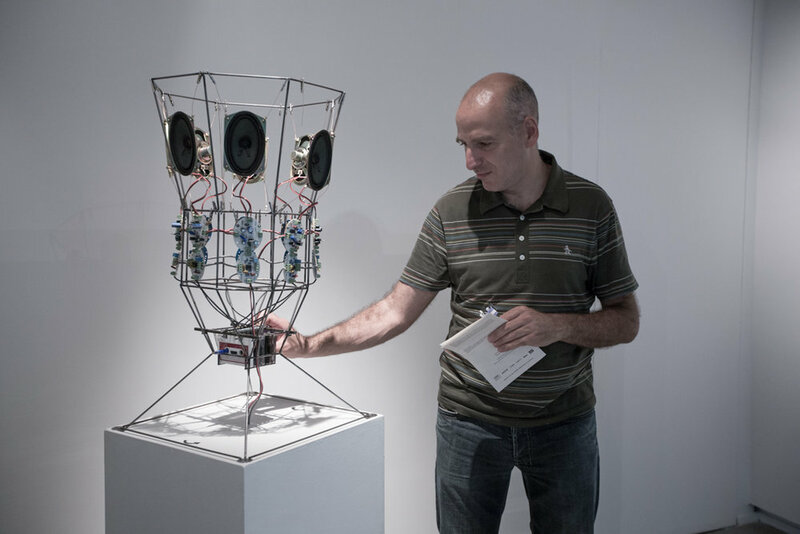 Mecatónica is a reactive sound object with an interface commanded by the public. The audio comes from 8 cassettes whose tape has been cut and extended forming loops that reproduce indefinitely. Each sound signal passes through a preamplifier and finally an amplifier that sends the signal to a motor. Since the motor does not have the capacity to agitate the air in the manner of a loudspeaker, that signal is inaudible. But this flow of electrons in the motor generates an electromagnetic field that can be captured by an inductance (small copper coil) located at the end of one of four axes (controlled by the public). Each inductance is connected to a speaker (via amplifier) that allows to finally hear the signal "hidden" in each motor. Modo submarino (Submarine mode) is a reactive sound object whose purpose is to “materialize” the electromagnetic activity of the cell phones of the public. 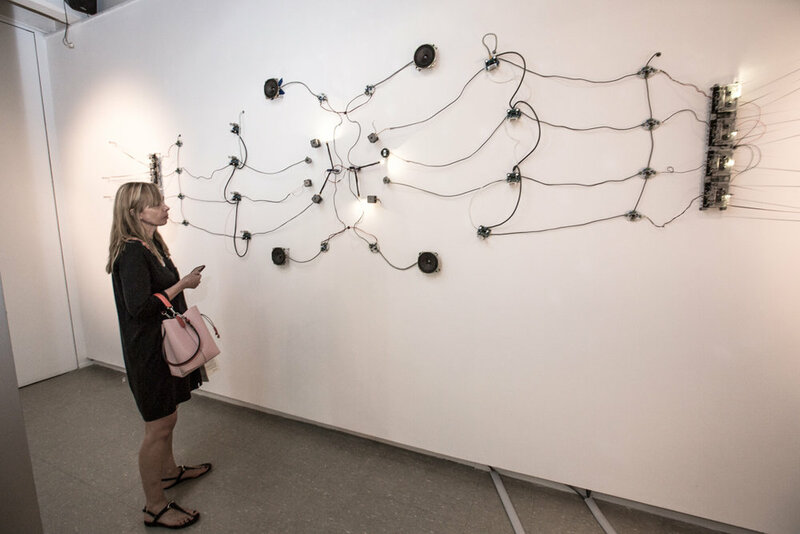 Through an inductance (copper coil) that hangs against the wall, people can sense their cell phones. The electromagnetic activity is captured and immediately processed as an audio signal. When the signal exceeds an amplitude threshold, it triggers the ignition of the motor that starts to spin a loop of tape. The processed audio is recorded on the tape and played sequentially on each of the 5 tape heads it goes through. Two preamplifiers and amplifiers allow to hear, through speakers, the passage of the signal recorded by each head. At the end of the tour, a magnet erases the magnetic activity recorded on the tape to start all over again. !AV is an intracranial audiovision instrument made up of a helmet connected to an electronic circuit. To perceive sound and images, it is necessary to cover your ears and close your eyes. 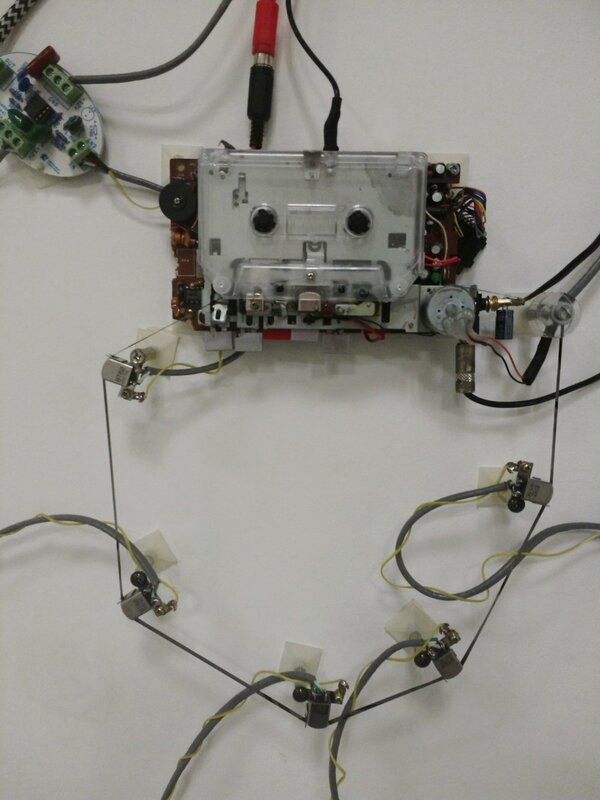 A droning sound recorded to a tape loop in a Cassette is heard through transducers that transmit the sound vibration directly to the skull, which functions as a resonant box. The tonal variation of the sound corresponds to the control of the speed of the motor that rotates the cassette. The light patterns are generated by a line of LEDs and are generated randomly "bypassing" from time to time the colors, ignition sequence and repetition speed, making each session unrepeatable. La voz de la fuente (The voice of the source) is a multi-channel reactive sound object. The audios come from seven found cassettes whose tape rotates by means of two cranks activated by the public. The impossibility of generating a constant speed in the manner of the motor that is traditionally used for this function, causes particular sonorities, impossible to achieve otherwise. Eight speakers simultaneously reproduce these signals.